Meditation in nature ・ Mindfulness and health! We want to make a pocket-size ZAFU! SHIMOGYO-KU, Japan - Dec. 21, 2017 - PRLog -- Meditate in nature, with mindfulness and health! Kickstarter launches a project starting December 14th with a project to create a pocket-sized cushion (cushion)! ! Mohan Co., Ltd. feel the ZEN Miyamoto Yusuke. We Mohan Co., Ltd. is a company that conducts web design, graphic design, product planning. In 2016, we launched the project "feel the ZEN" that connects people and temples with the power of design with the theme of "Zen" which had a big influence on Japanese culture as a whole. 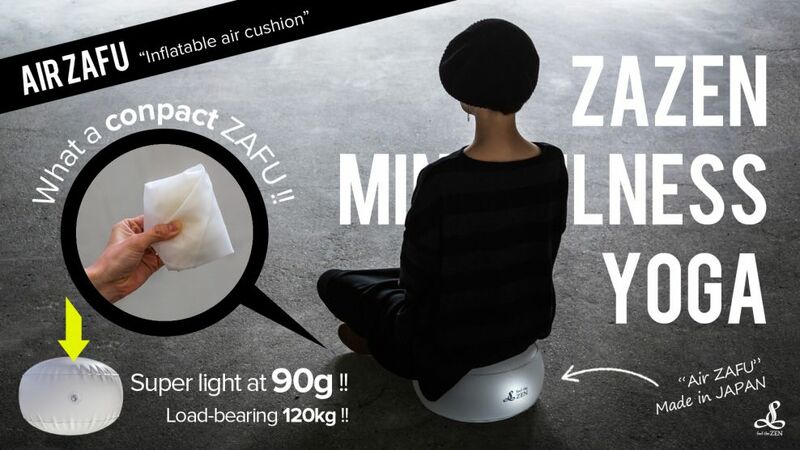 feel the ZEN sells zazen cushion "ZAFU (ZAMAMA)" as an original product and selling it. My hobbies are nature trekking, camping, cycling and so on. On holidays, we enjoy trekking and camping, meditating in nature and making tea. When doing meditation with outdoor, it was inconvenient to carry bulky at cloth made of cloth, it was hard to take it to the mountains and the sea. I thought that meditation can be done anytime anywhere if there is a small glove that is convenient to carry and I decided to make a mobile seat that inflates with inflating the air. A satisfactory prototype is completed and it will finally proceed to commercialization and launched crowdfunding with Kickstarter (kick starter) from December 14th. We are thinking that you can do zazen, meditation and mindfulness everywhere with "AIR ZAFU" which is compact and convenient to carry. It is a cushion used for zazen and meditation. During zazen and meditation, I use it under the buttocks. You can make your legs less numb and keep you in the right posture. There are round shapes and square shaped loci, which are used properly by sects. Usually it is made of cloth and panya. I made it to AIR ZAFU which can carry a round shape seat grip. Many people would like to meditate comfortably in nature. ① Compact and easy to carry! Inflate, just sit down! Meditation on the earth! It's like a small balance ball! What? Because it is a type that inflates with air, it will be grazed before you get used to it.You can use it with confidence in the first person by adjusting the air volume. It can be stored in pocket size and is easy to carry. That's good Air Zaaf on the trunkKeep it at a reasonable price from your regular seat! Zazen everywhere! Meditation everywhere! Air to Zafu! ※ We are using fabrics that are supposed to be used outdoors, but we are considering the storage size and weight, cost aspect so we are just barely thick. Please be aware that using on sharp objects or in places causes damage. Project name: "I want to make a pocket-size seat (cushion)" with nature, meditation, mindfulness and health! " Assistance method: Visit the site of "Kickstarter" below and register after registering the account. Credit cards are available.